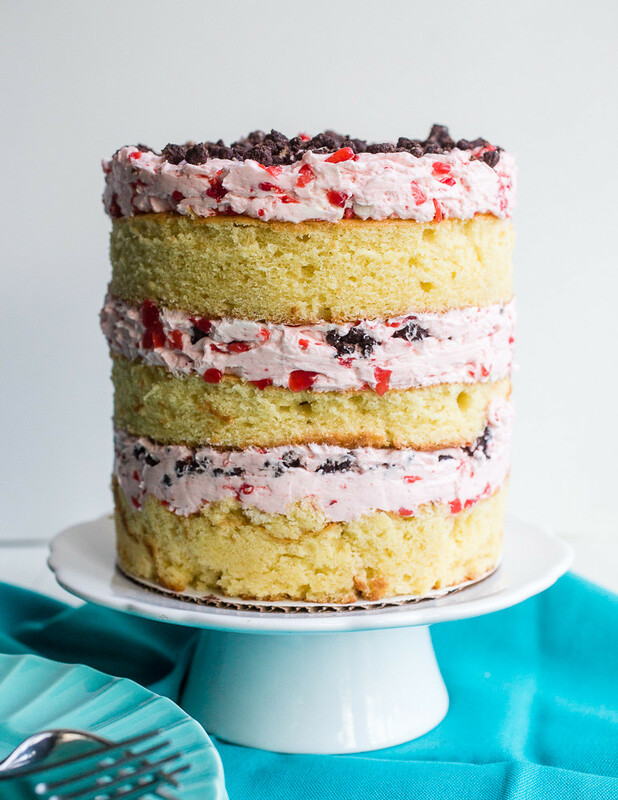 Just a sliver of this strawberry vanilla layer cake, with all of its chocolate crunchies nestled inside the most insanely delicious strawberry buttercream you’ve ever eaten, you’re gonna need your yoga pants. I feel like I need apologize for the sugar rush that’s been happening here of late. And in advance for what the next two weeks look like. 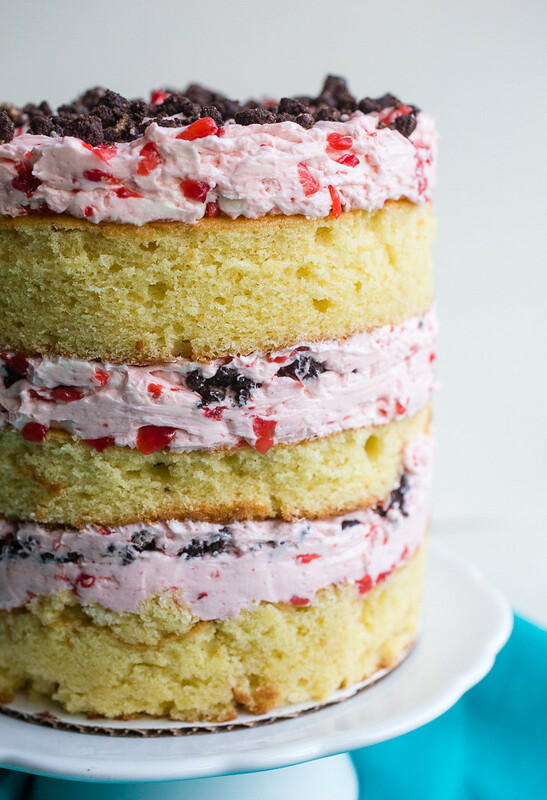 Let’s start with this strawberry vanilla layer cake though. And later this week, we’ll do a trashed-up kale (of course) salad and a new brunch-at-home menu. But for now? This cake will have to do, though it’s not like I’m asking you to sacrifice anything here. 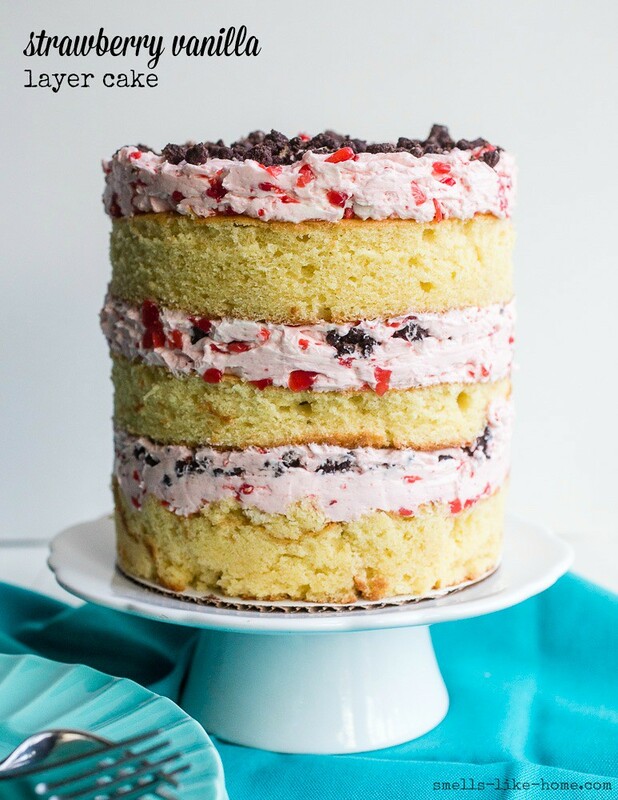 Because vanilla butter layer cake with strawberry Swiss meringue buttercream and chocolate crunchies? ANYWAY. You’re gonna want to keep them handy. Because before you slice off a sliver of this decadent cake – maybe for Valentine’s Day? 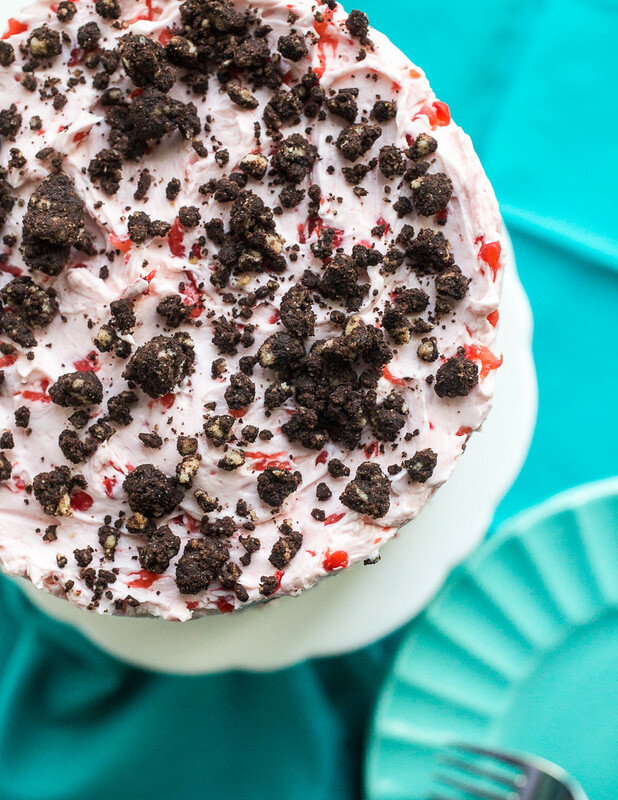 – with all of its chocolate crunchies nestled inside the most insanely delicious strawberry buttercream you’ve ever eaten, you’re gonna want to make yourself at home. Grab a steaming cup of coffee. Or tea. Or a cold glass of milk. Then dive into those vanilla layers, towering over their cake stand at 6 inches tall. And if you’re an OCD cake-eater like I am, make sure you get some cake, frosting, and crunchies in every.single.bite. But I won’t judge you if you just dive right in either. We’ve all been there, too. To make the cake: Preheat oven to 350° F. Grease the bottom and sides of a quarter sheet pan with butter, place a piece of parchment on the bottom of the pan, then grease the parchment and dust the sides of the pan and parchment with flour; set aside. In a medium bowl, whisk together the eggs, egg yolks, vanilla, sour cream, and buttermilk; set aside. In the bowl of a stand mixer fitted with the paddle attachment, mix the flour, sugar, baking powder and soda, and salt together. With the mixer on low, drop in the butter a piece at a time, and beat until the mixture looks like coarse sand. With the mixer still on low speed, stream in half of the wet ingredients and then increase the speed up to medium and beat for 30 seconds. Return the mixer to low speed, add the remaining wet ingredients and again at medium speed, beat the batter for 30 seconds. Scrape down the sides and bottom of the bowl and give the batter a good couple of stirs with a rubber spatula. Pour the batter into the prepared quarter sheet pan and level off the top with an offset spatula. Bake for 30-35 minutes. During baking, the cake will rise and puff up so don't be alarmed. When completely done, the cake should bounce back when lightly pressed at the edge and not jiggle in the center when gently nudged - check for this at the 30-minute mark. If the cake isn't finished after 30 minutes, bake for another 3-5 minutes. Keep in mind that dark pans will require less time and probably not the full 35 minutes. Cool the cake in the pan on a wire rack until completely cool (you can speed this up in the fridge or freezer). Either wrap the cake in the pan in plastic wrap and refrigerate for up to 5 days or proceed with the assembly instructions below. To make the chocolate crunchies: Combine the flour, cornstarch, sugar, cocoa powder, and salt in the bowl of a stand mixer fitted with the paddle attachment; blend on low until fully incorporated. Add the melted butter and stir until the mixture stars coming together in small clusters. Scatter the clusters in an even layer on a parchment- or silicone-lined baking sheet. Bake for 17-20 minutes, breaking them up every 5-6 minutes. When finished, they should be slightly moist - they will dry and harden as they cool. Allow the crumbs to cool completely before using. To make the cake soak: Whisk the milk and vanilla together in a small bowl. To make the strawberry Swiss meringue buttercream: Puree the strawberries in a food processor until small chunks of strawberry remain and the mixture looks like jam; set aside. In the well-cleaned and dried stand mixer bowl, place the egg whites and sugar. Set the bowl over a pan of shallow water and bring the water to a simmer - the bottom of the bowl should not touch the simmering water. While the water simmers, lightly whisk the egg whites and sugar constantly. Once the mixture has reached a temperature of 160° F to 165° F on a candy thermometer and is completely smooth, remove it from the heat and attach it to the stand mixer with the whisk attachment fitted. Gradually increase the speed up to medium-high, whisking until the mixture is glossy and completely cool, about 8 minutes. The bottom of the bowl will be nearly cool as well. With the mixer on medium-low, plunk the butter into the bowl two tablespoons at a time, allowing each addition to incorporate completely before adding the next two tablespoons. Scrape down the sides of the bowl and increase the speed to medium, beating until the buttercream comes together about 10 minutes. The mixture will be very loose at first and then it will curdle. Keep beating until it smooths out into a thick buttercream frosting. Once this happens, switch to the paddle attachment and mix the frosting on low speed for 2 minutes to release any air bubbles. Gradually stir in the strawberry puree until thoroughly combined. To assemble the cake: Invert the full cake layer from the pan onto a piece of parchment paper or Silpat/silcone baking mat on the counter. Peel off the top piece of parchment away from what is now the top of the cake. Using a 6-inch cake ring, cut out two rounds of cake. These will be the top two layers of the finished cake. Use the remaining scraps for the bottom layer of cake in the following steps. Wash and dry the cake ring and place it on a parchment-lined baking sheet (I washed and reused the quarter sheet pan so it will fit in the freezer later in the process). Line the inside of the cake ring with a piece of acetate that overlaps at the edges and tape the edges together from the outside. Cobble the cake scraps together in the bottom of the ring to form the first layer - the height should be about equal to that of the other layers. When you think you can't squeeze any more cake in, keep going - you want this to be a sturdy layer under what will be a heavy cake. Brush the top of the layer with some of the cake soak. Spread 1/5 of the frosting (each filling layer will have 2 layers of frosting) out over the cake in an even layer. Sprinkle the top of the frosting with 1/3 of the chocolate crunchies in an even layer. Spread another 1/5 of the frosting over the top of the crunchies - this doesn't have to be too neat. Add another strip of acetate into the cake ring, just nudging it down below to top of the frosting so that it overlaps at the edges; tape the edges together from the outside. You'll want the total height of the acetate pieces to be about 6 inches tall. Gently place one of the cut out cake layers on top of the frosting and repeat the filling instructions: cake soak, frosting, crunchies, and frosting. Place the remaining cake layer atop the frosting, brush with the remaining cake soak, slather on the remaining frosting, and scatter the remaining crunchies atop the frosting. Transfer the sheet pan to the fridge for at least 2 hours to allow the cake and filling to set. Alternatively, the cake, wrapped tightly, will keep for 2 weeks in the freezer. On serving day: Remove the cake from the refrigerator and with your fingers, pop the cake out of the cake ring. Transfer the cake to a cardboard cake round (at least 6-inches in diameter). (If you froze the cake, you'll need to do this at least 3 hours in advance of serving; allow the cake to thaw in the fridge.) When ready to serve, transfer the cake on the cardboard round to a cake stand or round platter. With a long, sharp knife, cut the cake into wedges and serve. Store the leftovers in the fridge, wrapped tightly, for up to 5 days or in the freezer for up to 1 month. Bake for 30-35 minutes. During baking, the cake will rise and puff up so don’t be alarmed. When completely done, the cake should bounce back when lightly pressed at the edge and not jiggle in the center when gently nudged – check for this at the 30-minute mark. If the cake isn’t finished after 30 minutes, bake for another 3-5 minutes. Keep in mind that dark pans will require less time and probably not the full 35 minutes. To make the chocolate crunchies: Combine the flour, cornstarch, sugar, cocoa powder, and salt in the bowl of a stand mixer fitted with the paddle attachment; blend on low until fully incorporated. Add the melted butter and stir until the mixture stars coming together in small clusters. Scatter the clusters in an even layer on a parchment- or silicone-lined baking sheet. Bake for 17-20 minutes, breaking them up every 5-6 minutes. When finished, they should be slightly moist – they will dry and harden as they cool. Allow the crumbs to cool completely before using. In the well-cleaned and dried stand mixer bowl, place the egg whites and sugar. Set the bowl over a pan of shallow water and bring the water to a simmer – the bottom of the bowl should not touch the simmering water. While the water simmers, lightly whisk the egg whites and sugar constantly. Once the mixture has reached a temperature of 160° F to 165° F on a candy thermometer and is completely smooth, remove it from the heat and attach it to the stand mixer with the whisk attachment fitted. Gradually increase the speed up to medium-high, whisking until the mixture is glossy and completely cool, about 8 minutes. The bottom of the bowl will be nearly cool as well. Cobble the cake scraps together in the bottom of the ring to form the first layer – the height should be about equal to that of the other layers. When you think you can’t squeeze any more cake in, keep going – you want this to be a sturdy layer under what will be a heavy cake. Brush the top of the layer with some of the cake soak. Spread 1/5 of the frosting (each filling layer will have 2 layers of frosting) out over the cake in an even layer. Sprinkle the top of the frosting with 1/3 of the chocolate crunchies in an even layer. Spread another 1/5 of the frosting over the top of the crunchies – this doesn’t have to be too neat. Add another strip of acetate into the cake ring, just nudging it down below to top of the frosting so that it overlaps at the edges; tape the edges together from the outside. You’ll want the total height of the acetate pieces to be about 6 inches tall. On serving day: Remove the cake from the refrigerator and with your fingers, pop the cake out of the cake ring. Transfer the cake to a cardboard cake round (at least 6-inches in diameter). (If you froze the cake, you’ll need to do this at least 3 hours in advance of serving; allow the cake to thaw in the fridge.) When ready to serve, transfer the cake on the cardboard round to a cake stand or round platter. With a long, sharp knife, cut the cake into wedges and serve. Store the leftovers in the fridge, wrapped tightly, for up to 5 days or in the freezer for up to 1 month. I love the milk bar method. Just made the funfetti cake with fruit pebbles crunch and the carrot cake with her Cinnamon Toast Crunch. I have to make this! Yum!! Cinnamon Toast Crunch is my favorite cereal EVER so I can only imagine how awesome that carrot cake must be! Sounds like an awesome cake to make this spring with in-season carrots! I love this cake!!! Thank you for blogging about it.